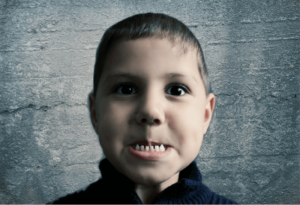 WHAT CAUSES DISCOLORED TEETH IN CHILDREN? Stained and discolored teeth in children can cause parents a lot of anxiety. Is that stain actually a cavity? Why are my child’s teeth discolored? Will they always look that way? How can I prevent this from happening in the future? Discolored teeth can also cause a child a lot of anxiety, so understanding the causes and treatments are important for both parents and their children. Fluorosis – the resulting dental discoloration ranges from chalky white to a brown-black appearance. Fluorosis is caused by excessive fluoride intake and is very rare. If you suspect the discolored tooth is more than trauma or massive amounts of fluoride, reach out to your pediatric dentist to determine the cause and the best course of action to address it. There are so many options to treat stained teeth; it’s best reach out to your pediatric dentist so they can recommend a specific treatment based on the cause. Limited dark colored beverages such as tea, dark sodas, etc. Of course, treatment depends on the cause of discolored teeth. Your pediatric dentist will create a treatment plan that best for your child. How can I tell why my child’s teeth are discolored or stained? Bringing your child into your pediatric dentist’s office will allow them to diagnose the possible cause of the stain or discoloration, possibly treat it if indicated, and to discuss ways of preventing similar problems in the future.